It is that time again. Time for reflection, resolutions, and the start of a New Year. I always get a double dose of it because January 1 is also my birthday. So not only has another year passed, but I am another year older. I like making resolutions but not the blanket kind that seem so popular this time of year. I will be healthier. I will lose weight. I will be happier. I like to be very specific with my resolutions. I will eat a green vegetable every day. I will read for at least 15 minutes every day . I will always put my shopping cart away at the grocery store. (That was actually one of my resolutions two years ago). One thing I want to focus on this year is improving my sleep. I think we all know that just about everything is easier to handle after a good night of sleep. For me I am in a much better mood, I snack less, I am more motivated to get my daily exercise in, less likely to get sick, and I could list about a million other things. And a good night's sleep is more than just going to bed earlier. Exercise, caffeine, stress, medication, even having to get up to go to the bathroom in the middle of the night can all affect how much deep sleep you get. But trying to keep track of all of this on your own is enough to make you lose sleep. That is where my new Zeo Sleep Manager comes in to play. Best Buy sent me this handy gadget to help me with my 2012 resolution. I have used a couple of apps on my iPhone to track my sleep before, but most of them just measured your movement during sleep and the results were easily thrown off by things like your husband turning over or a child climbing into bed with you. The Zeo is actually a headband with sensors that you wear. It tracks your REM and deep sleep throughout the night and then shows you a graph each morning along with your sleep score. These are both screen shots from my phone. Yes, I slept for eight and a half hours, but only because it was my birthday, and sleep is really the only present I ask for on my birthday. I took a nap that day too. I love seeing how long it takes me to get to sleep after I lay down at night. See that nice 5 minutes of REM sleep in between being awake at the beginning? That was me falling asleep and then being woken up by my four year old. That is how detailed and accurate these graphs are. Now looking at the graph is interesting and often offers validation about how you are feeling, but the real fun starts when you sign in online. 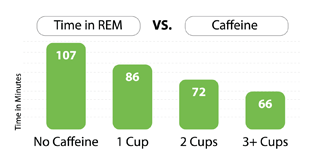 With a few easy clicks you can track everything from how much caffeine you drank to how many times your sleep was interrupted by your snoring husband or your sick 4-year-old. You can graph your results to help see how these 'sleep stealers' are affecting your sleep. So now instead of making a blanket statement about getting more sleep in 2012, I can focus on making specific choices that will help me reach that goal. I won't drink caffeine after 3pm. I won't watch TV after 10pm. I will sleep in a hotel where my family can't interrupt my sleep. It is a good thing I don't expect to be 100 % on any of my resolutions. 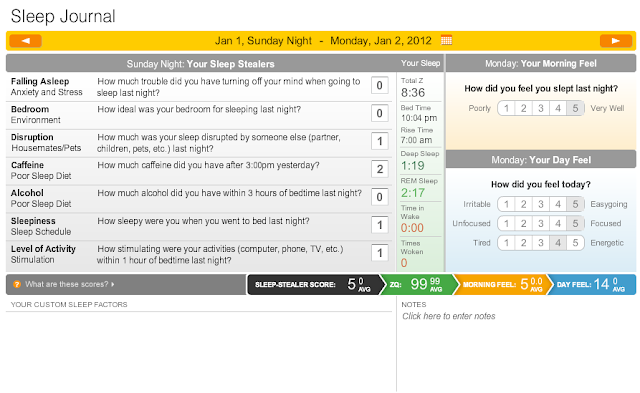 All of this great information is really easy to get from the Zeo Sleep Manager. It is easy to set up, even easier to use, and all of these results only take a few minutes of your time every day. You pop the Zeo off the magnetic charger, and your phone will walk you through all of the steps. Steps like put the headband on, plug your phone in, and go to sleep. If you don't have an iPhone or Android mobile phone then there is a bedside version of the Zeo Sleep Manager too. I don't want to be the only one getting better sleep in 2012, so Best Buy is giving away a Zeo Mobile Sleep Manager to one of you too. Just leave me a comment letting me know your biggest sleep stealer is, and you will be entered for a chance to win a Zeo Sleep Manager of your own. d)For those with no Twitter or blog, read the official rules to learn about an alternate form of entry. The sweepstakes runs from 1/11 - 1/17/2012. Also be sure to visit the Inspiration to Fitness page on BlogHer.com where you can read other bloggers' reviews, find great fitness tips and find more chances to win! You can also click on the Best Buy image at the top of my blog to view a calendar of all the Inspiration to Fitness content. Good luck! *Disclaimer - This is a compensated review from BlogHer and Best Buy. 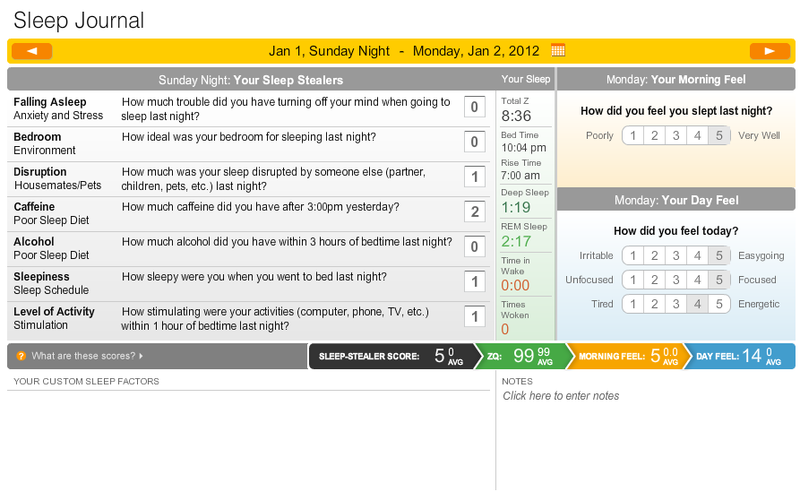 I was provided with a Zeo Sleep Manager to use for the purpose of this review and was compensated for my post. All opinions and results I share are my own. Glad to hear you're concentrating on healthy, attainable, and specific resolutions. I think that makes them easier to stick with than the vague stuff that has no certainty to it. sleep stealer - - - kids, of course! My biggest sleep stealer.......stress and too much caffeine. My biggest sleep stealer - kids in the bed and spending time @ bedtime to go through the "to do" list in my head. I have an issue turning my brain off at night. I barely have time to think during the day, but once my head hits the pillow, all the thoughts come rolling into my head. I think that I steal sleep from myself. I tend to stay up WAY too late at night and don't give myself the opportunity to sleep longer. I sleep for 8+ hours and I wake up feeling like I never went to bed! I'm not even sure any more what my sleep stealers are. I've been suffering from a long bout of insomnia (nearly 2 years) I've tried it all...no tv, no lights, getting to bed earlier, cold room, sleeping alone, over the counter and prescribed sleep meds, the list goes on. Some things work for a bit of time but in all honesty I feel like I've been living in a sleeples state for two years. I'n intrigued by this little machine and that it allows you to log on and evaluate your sleep patterns giving you a chance to figure out the problem. I'm off to scour the internet and read up some more on this. As someone that feels debilitated by not enough sleep I so appreciate you sharing this product and your feelings about it. My biggest sleep stealer is pain and a chronic physical condition, but this little device might even help with those! yay! who knew? Work is my biggest sleep stealer! I have to get up very early to avoid a long commute. This is such a cool device! Haven't heard of a sleep manager before, but would love to learn more about how I sleep, and more importantly, how to get more of it! Me time steals my sleep. After kidos are in bed, I get to do what I want. Sleep doesn't always come first. Boo. What a great giveaway. I think I really need to try this gadget! I had no idea that such a thing existed, and I think I could really benefit from it. My husband wakes me up often in the night (snoring, grinding his teeth, talking, hogging blankets), not to mention any of our 4 kids, or dog moving around in the night. I wake up most mornings feeling exhausted and I wonder if it is even worse than I realize. It is very rare that I wake up feeling rested or energized and ready to start my day. I would love to know if I am getting any quality of sleep, or if it just feels worse than it is. What an incredible invention?! Staying up too late! Just never seems like there is enough hours in a day to get all that I want to done! Work is my biggest sleep stealer. I stay up late to blog and then have to get up early to go to work. the voices in my head reminding me of the long list of things I didn't finish that day ... hard to keep them quiet. Has to be the kids, although a snoring hubby doesn't help! I must not get very deep sleep because I am always tired. I am also a very light sleeper so any and every noise wakes me up. My sleep stealer is a cute little bug named Tate. I would LOVE to see how much sleep I'm actually getting, or maybe it's better not to know! Ha! Thinking of my endless to-do list or creating new projects/designs for my house in my mind. I would LOVE to see my sleep patterns. It seems like no matter what time I go to bed, early or late, I always wake up super tired still and I stay tired ALL DAY. It would be nice to figure out what's wrong with my sleeping habits. This is sweet. I’d love to have one. I’ve had trouble sleeping for years due to a medical condition. It also doesn’t help that I am a night person with a day person’s job. I have to force myself to go to bed at night and am exhausted EVERY morning. If I could maximize the little sleep I get it would be so wonderful!! And I have a cat that sleeps with me, enough said! Kids. Definitely kids. Life before kids= blissful sleep. Life after kids= constant tiredness. Btw, I have 5. The worst sleepers by far are the boys (at the tail end). Crikey! I wish they would both sleep through the night consistantly! That seems really neat and helpful. Usually my sleep stealer is my own mind that won't shut off, but also too much light. I've got thick, dark curtains but that morning sun can be rough sometimes. My sleep stealer is caffeine! And maybe one, two or all three of my toddlers crawling into bed with us in the middle of the night. Or maybe my husband's snoring....ha! My biggest sleep stealer is the TV in the bedroom or magazines on the night table. Is it too late to enter? It's 3am and I'm wide awake. I need this thing! My biggest problem is turning my mind off when I go to bed! That is why I started my blog, in hopes that once I get all these ideas out of my head, I will be able to sleep better. Did it work? So far no, but I've only been blogging a few days and there are still many more ideas I haven't gotten to yet. So here's hoping it will get better soon! It used to be the internet, but now it is my husband watching some show that causes me to be FULL of adrenaline right before bed even if I try to walk it off on the treadmill. Ugh. It's tough to go to sleep with thoughts of, "Oh, my goodness. What would I have DONE????" Sigh. I'd love to win so I could learn more about my sleep! Maybe it could help me to sleep better!